Summary: The male hormone, testosterone, is responsible for muscle strength and weight control in both men and women. Testosterone in our body peaks around the age of 25-30, and then continuously declines. This age related decline is main reason why we gain weight, loose muscle strength, feel anxious and tired. It is one of the most commonly abused hormones among athletes to make up for the age related muscle decline. Increased weight, diabetes, and other health conditions can abnormally affect levels which can further compound these problems. Once diagnosed, it is relatively easy to monitor and correct for low testosterone levels. A simple saliva test (with an at home testosterone test kit), without requiring any needles, can measure free testosterone levels in the body. This article will discuss details about this key hormone, the natural decline with age, how one can test for testosterone, and how it can be maintained naturally. Testosterone is a hormone that both in men and women produce, although we commonly associate it with male sexual health. It is responsible for muscle strength, bone mass, and fat distribution in our body, especially around the waist. T production levels peak around age 25 before starting to decline. This decline is part of the natural aging process, falling about 1% per year as we age. Because it helps repair muscle tissues, it is one of the most commonly used hormones by athletes to build muscles and make up for this age related muscle decline. Low T levels can lead to weight gain, decreased muscle strength, anxiety, and fatigue. In old people, the low levels make men ‘cranky’, disinterested, and less sociable. The increased weight, diabetes, and other health conditions can negatively affect the levels, which can further compound these problems. It is relatively easy to test for testosterone levels. An at home kit using a saliva sample can accurately determine your levels. The test measures free testosterone which is a better predictor of biologically active form in the body. The test is relatively inexpensive and one can do it from the comfort of home by shipping the samples to a lab. Besides the convenience and confidentiality it offers, the biggest advantage of the test is eliminating the need for a blood draw. That’s especially important for those afraid of needles. Once diagnosed, it is easy to monitor and correct for low testosterone. However, this should be done after discussion with a physician as the FDA warns that there are risks of heart attacks and strokes associated with products used for correcting low testosterone levels. What are the key issues related to testosterone changes? Why is testosterone popular among athletes? What is hypogonadism or low-T problem? 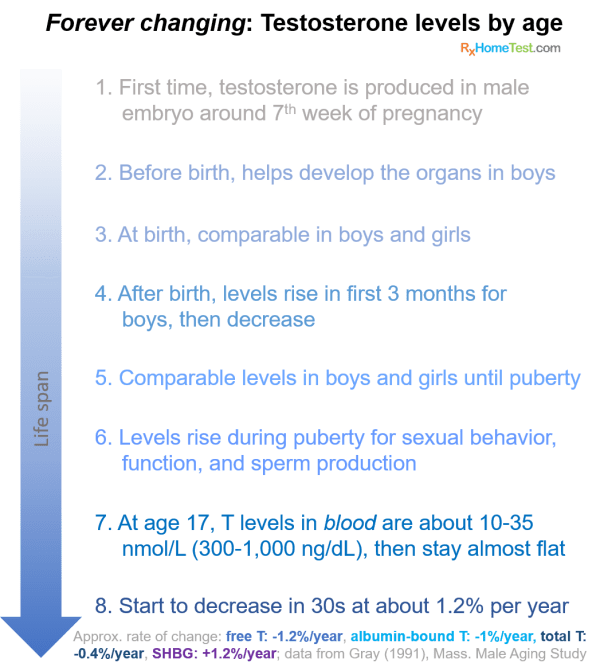 What are the symptoms of low testosterone or hypogonadism? What are different forms of testosterone? Total Testosterone: it includes all the available male hormone in the body, and has three different parts: free testosterone (about 2%) + testosterone bound to SHBG protein (60-80%) + testosterone bound to albumin (20-40%). Whatever is bound to SHBG is not active. Therefore, total testosterone is not the best indicator of healthy levels. The Harvard Men’s Health Watch provides an excellent description of total and free testosterone. How to get tested for low testosterone? It is recommended to provide samples in the morning, around 7-10 am, within 30 minutes of waking up when the T levels are highest. Note that testosterone is age dependent and therefore should be compared against a reference of same age group. What are the challenges to testosterone testing? Is there a diagnosis for low testosterone? What are the natural ways of increasing Testosterone? From Harvard Men’s Health Watch, read about the complexity of symptoms of low T, details on different ‘kinds’ of testosterones, what are normal testosterone levels, and how even experienced physicians have differing opinions on how to get tested for low T: Testing your testosterone: It’s tricky. After testing, see your physician for next steps; there is an increased risk of heart attacks and strokes from using testosterone as outlined by the FDA Drug Safety Communication.